Need help identifying a song you heard on the radio or playing in the background of a TV show? Iden.tify.us might be able to help you do that if you happen to have a recording of your unknown song or remember a few lines of it. 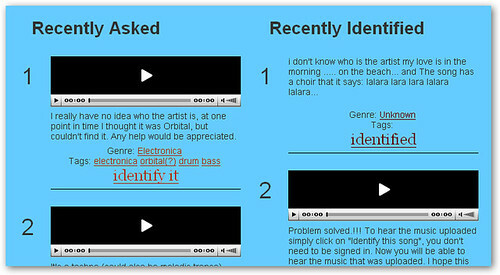 The site connects you to other users to help put a name to a song in a collaborative effort. You can either upload a song, link to it, or simply describe it in words to get started. The cool part is that you can listen to uploaded songs to ID them and even embed them in other web pages.